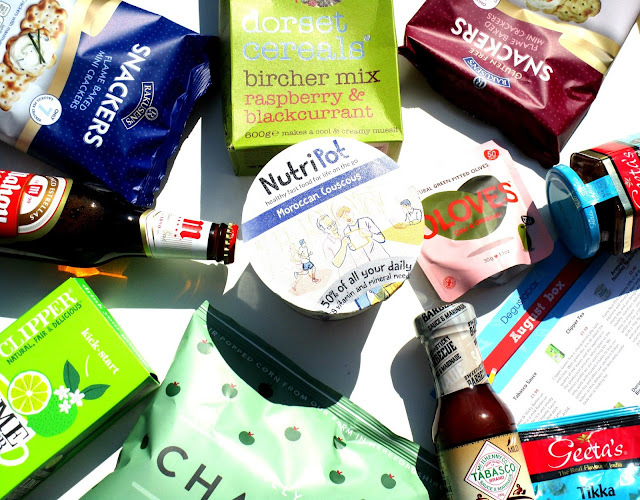 I have a subscription box review for you all today but it's a subscription box with a difference.... it contains yummy food and drink, so say hello to Degustabox*. 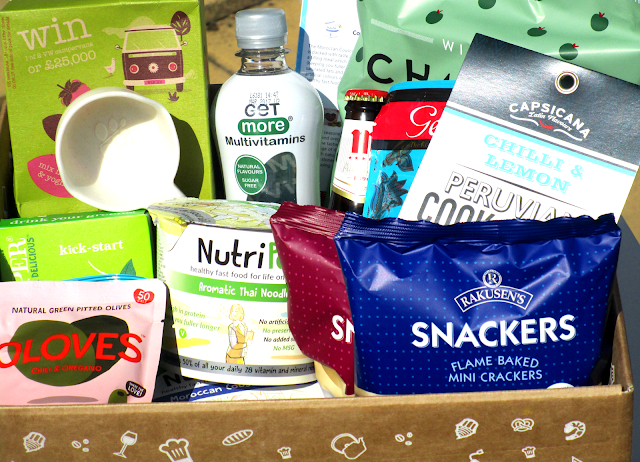 Degustabox works very much like how beauty subscription boxes work, for £12.99 a month (postage included within the £12.99 price) you will receive 9 to 14 surprise food/drink products, many that are completely new to the market! So if your a bit of a foodie like myself and you love subscription boxes your going to love this beaut's! I have to say that over the last few months the contents of each box really has been amazing, I literally cant wait to tuck in and this months certainly has me drooling he he! 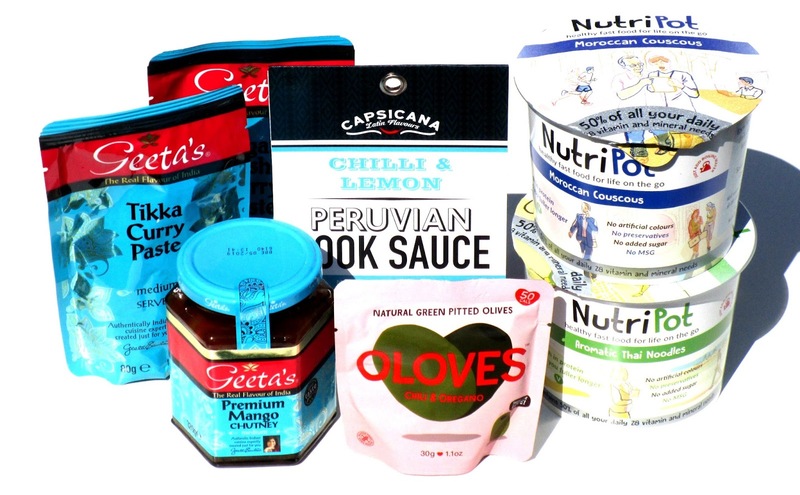 This month we have 16 yummy food and drink items to sink our teeth into starting with some savoury treats from NutriPot, I had their Aromatic Thai Noodles £2.49 and their Moroccan Couscous £2.40 to try both of which where super yummy, their kind of a posher, better for you pot noodle with 50% of your daily vitamin and mineral needs, pretty cool huh! I absolutely love a curry and I'm always making them at home so I was super happy to see three things from the brand Geeta's to try, theres a Tikka Curry Paste £1.00, Rogan Josh Curry Paste £1.00 and Mango Chutney to give a whirl. 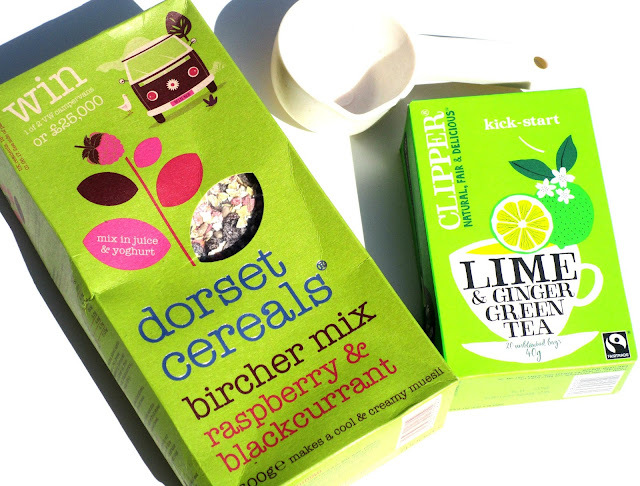 Moving on to some bits perfect for breakfast we have a box of Dorset Cereals Bircher Muesli in Raspberry and Blackcurrant flavour £3.49, I love having this with a vanilla yogurt topped with some fresh fruit, it's such a yummy, healthy breakfast and I adore the little measuring cup Degustabox threw in too. We also have a box of Clipper Lime and Ginger Green Tea £1.59, I'm not the biggest fan of green tea however I'm still keen to try this to see if the lime and ginger flavouring makes it taste yummy! 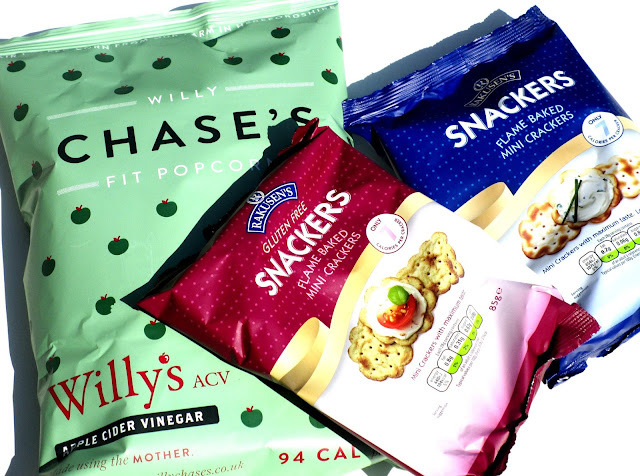 Then I have a couple of snacky bits in my box this month starting with the Willy Chase's Fit Corn in Apple Cider Vinegar £2.19, now I do love popcorn but I wasn't too keen on this flavour however I love that this brand ventures into different more unusual flavours, I think it's really cool! The last two snacky bits are by Rakusen's Snackers, these are healthy crackers that contain just 7 calories per cracker and as I blooming well love crackers these two bags didn't last long in my house, I enjoyed mine with cheese and also dipping in salsa, yum! I also got some Sweet and Sticky Barbecue Sauce and Marinade by Tabasco £1.99, we go through bottles of barbecue sauce in our house so I cant wait to start using this, it certainly wont be around for long! Last up this month I have some drinks, starting with the Get More Multivitamins Sparkling Lemon and Lime £1.45, to me this tasted just like Sprite or 7up however it's so much better for you and contains 6 varieties of vitamins, natural flavours and theres no added sugar! Another refreshing drink I had this month is Fentimans Sparkling Lime and Jasmine. 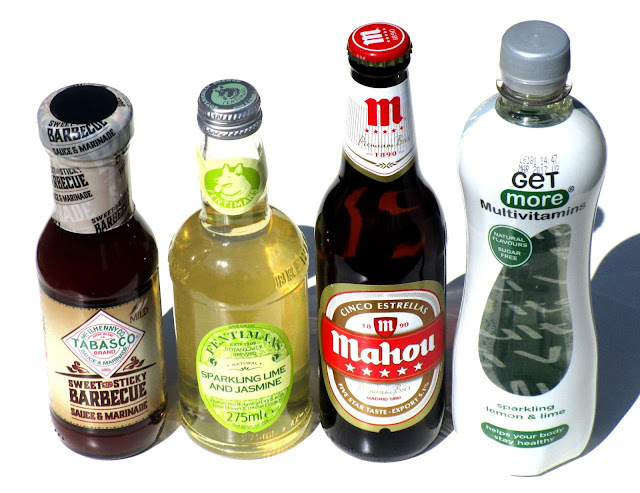 The alcholic drink we have this month is by Mahou Cinco Estrellas £1.20, which is a premium Spanish lager that my boyfriend actually loves so he will be polishing this off. Luxury Face of the Day! Top 5 Makeup Products Under £5!